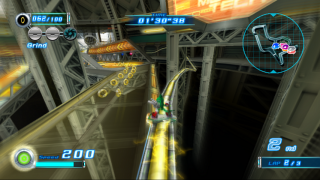 Security Corridor is the sixth level in the Babylon story of Sonic Riders: Zero Gravity. Racing to the top of the MeteorTech tower to stop Eggman's plan, Jet must outpace Sonic and the rest of the riders in this largely vertical stage. Make good use of the grindrail routes and other shortcuts in order to get first place. What is the "lightless black" referred to in the Babylonian scrolls? As the plot thickens, Eggman raids the airship to steal the stones! Wave and Jet are once more ensconsed in the Babylon Rogues' airship stateroom when Storm once again bursts in on them. Jet's initial rage at his subordinate's late return from Tempest Waterway is defused when Storm shows him what he's brought back: two Arks of the Cosmos, looted from SCR-HD and Amy Rose. Unknown to the Rogues, Robotnik is personally on board the airship, listening in on Wave's monologue about ancient Babylonian records. In a remarkable bit of infiltration for a loud, obese man, he swipes the two Arks right from Jet's desk without anyone noticing, and takes off in his Egg-O-Matic. Finally twigging that they've been robbed, Jet orders full speed ahead to catch up with the scientist. Outside Crimson Tower, the Rogues greet Team Sonic as they arrive from the desert. Explaining the situation inside the facility, Jet suggests to Sonic that they race to the top of the tower and stop Eggman. The level itself includes much of the gravity-confusion of Crimson Crater, with racers traveling along tower walls and up the support superstructure. In order to win, Jet must take first place, ahead of all Team Sonic, Amy, and his fellow Rogues.